Sometimes I’m amazed how long some products have been around. 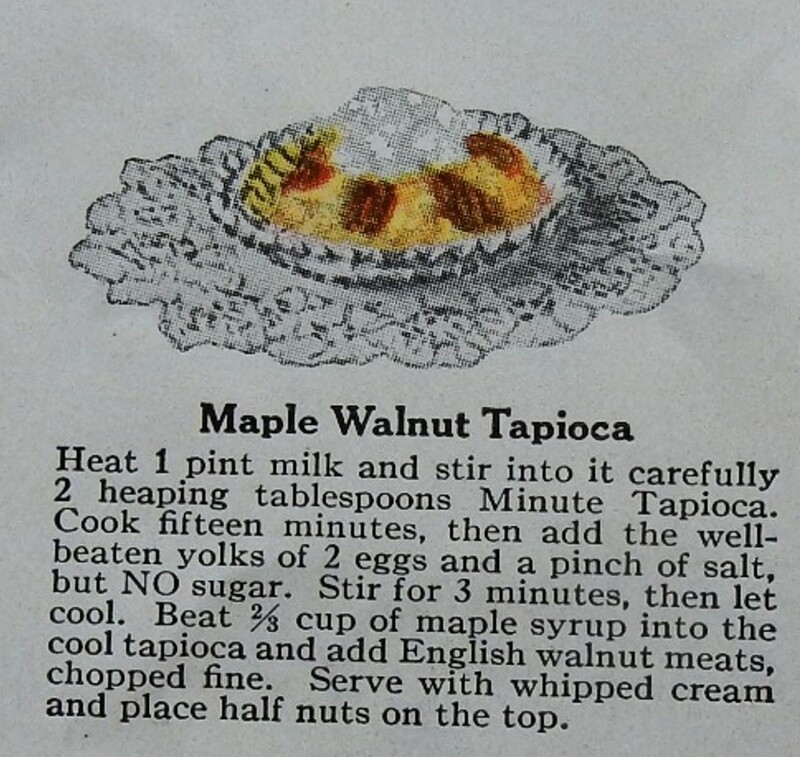 I recently was browsing through a hundred-year-old magazine and was stopped in my tracks when I saw an advertisement for Minute Tapioca. 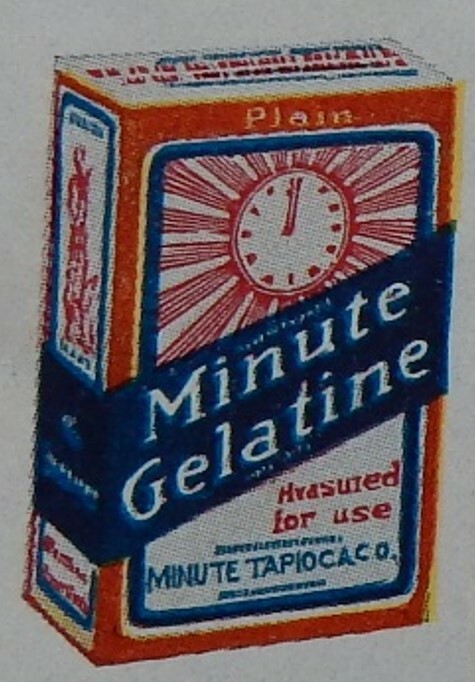 I did a little research and discovered that Minute Tapioca has been sold in the U.S. since 1894. By 1916 it was widely available throughout the country. The old ad was chock full of old tapioca recipes. 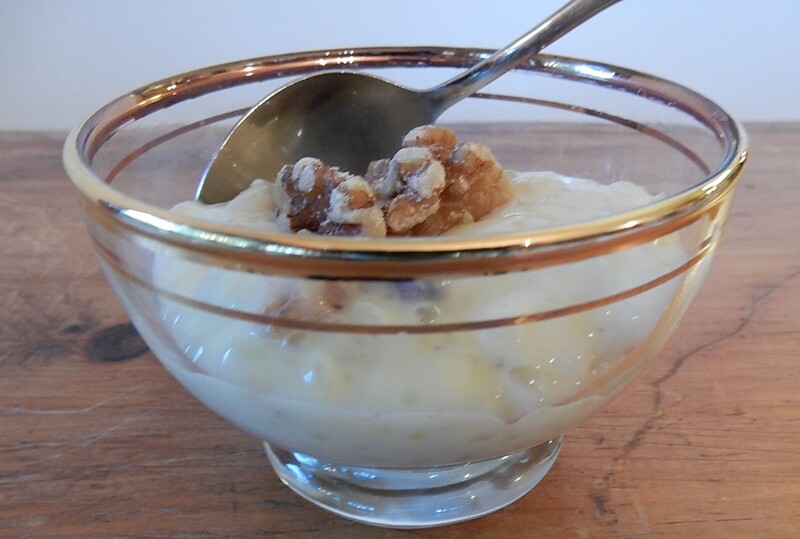 A recipe for Maple Walnut Tapioca particularly intrigued me, so I decided to give it a try. Tapioca pudding is a little tricky to make because it requires lots of stirring while cooking prevent burning, but it’s well worth the effort. This classic recipe is delightful with a hint of caramel which blends perfectly with the crunchy walnuts. Heat milk in a saucepan using medium heat while stirring continuously until it begins to steam. Stir in the tapioca, and cook for 15 minutes while continuing to stir continuously. Midway through the cooking time, the mixture will begin to boil. When this occurs reduce heat so that there is a very slow rolling boil; continue to stir constantly. Remove from heat at the end of the 15 minutes. Remove from heat, and cool in the refrigerator, then stir in the maple syrup. If the maple syrup does not readily mix with the tapioca mixture, beat a few seconds until combined (I used an electric mixer); then stir in the chopped walnuts. If desired, may be garnished with walnut halves or whipped cream. Posted on July 3, 2016 June 30, 2016 by SherylPosted in recipeTagged desserts, pudding. I really need to turn my friend on to your blog. She is slightly over 70 and makes the best desserts ever. She will love this site! I’m honored that you think this blog is worthy of sharing with a friend. It sounds like we have a lot of similar interests. Interesting recipe. I’ll have to check whether minute tapioca is available in Australia. I doubt it because regular tapioca is very hard to find. Interesting. . . I don’t have any problems finding tapioca, but it doesn’t seem to be nearly as popular as it once was in the U.S. I love tapioca and the maple walnut version sure sounds wonderful!! wow…my husband loves tapioca. As soon as he can eat again, this is one thing I will make for dessert. I hope that he feels better soon. Thanks he has an operation on Wednesday, so he must fast until then. An exploratory to see if the cancer tumors have reappeared. My thoughts are with you and your husband during this difficult time. I hope that all goes well and that he gets good news. I have fond memories of tapioca pudding. I didn’t know that it had been around for so long. So do I. It’s one of those timeless comfort foods that is always delicious. I love the addition of maple here. Looks delicious! By the way, I let the tapioca soak in water for 10-15 minutes before cooking. It shortens the cooking time dramatically. This is a recipe that I really struggled with how closely to follow the original directions. I agree with you that there are ways to reduce the cooking time -which would make it less likely for the tapioca on the bottom to the pan to scorch if not stirred carefully. I considered revising the recipe to more closely follow the directions on the modern Minute Tapioca box- but in the end I stuck with the basic directions in the original recipe. Yes, I understand the need to as close to the original recipe as possible. I guess the idea of soaking the tapioca first came later. Comment to other readers: If you are reading this string of comments and decide to make this recipe, you may want to consider following Ronit’s suggestion (or the directions on the Minute Tapioca box). And, if you experiment with cooking times, soaking, etc. – it would be wonderful if you could let us know how it turned out. I know others who may want to make this recipe in the future would appreciate hearing about what you learn. I am now wishing that I had bought the tapioca I saw in the supermarket last week. I haven’t had tapioca pudding for years. Exactly. Though perhaps I should finish the semolina that I bought instead of the tapioca. There was sago on the shop shelf too! So much choice. I haven’t had tapioca in years either–all I really remember is the weird mouth-feel. The flavors in this recipe are ones I love so maybe I should try again–the walnuts would change the consistency . . . Sounds delicious! My late mother-in-law loved tapioca pudding, but she always had it plain. I think she might have liked this version. I know that I turned up my nose at tapioca when I was a kid, but I’ve actually discovered that I like tapioca pudding, both plain and flavored, as an adult. Several years ago I did a post on Strawberry Tapioca which was quite good (though the recipe called for regular tapioca pearls rather than minute tapioca – but I think that the recipe could easily be adjusted). I’m not fond of tapioca but the maple and walnut tempt me to try this. I don’t like the pearl tapioca at all, so I use the other kind. Actually, I’d call this one an easy (even super easy) recipe. It was one of the first things I learned to cook, and I still like it. As for the sugar — I don’t worry about it one bit. I keep thinking about the fact that, despite the puddings, cakes, pies, cinnamon rolls, etc. etc. that we consumed “back in the day,” there were very few overweight people. Of course, we were far more active — we walked to school, for example. In grade school, we had a half-hour of recess, morning and afternoon — with plenty of free play, including dodge ball, monkey bars, and tag. We rode bikes as we pleased, and roller skated. And our parents? Busy all the time. It made a difference. No need to be quiet – I enjoyed reading your comment. I also find it fascinating how much sugar (or in this case maple syrup) is called for in many old recipes. They definitely didn’t seem to worry as much about eating sugar as we do. I agree that people exercised more back then, so that probably is one reason sugar was less of a concern. Of course they didn’t have high fructose corn syrup back then (though they had Karo-type syrups), so maybe that is part of the difference across the years. I also think that people may have sometimes eaten very sweet foods-but had smaller servings back then. When I make hundred-year-old candy recipes, I’m sometimes amazed by how sweet some of the candies are – but people may have only eaten a piece or two at a time. That’s exactly right — serving portions were much smaller, all around. Even main courses were smaller. What we call dinner plates these days were serving platters back then! When I was growing up, my mother made a mean cherry pie, and she always insisted on using tapioca as a thickener. I’m not sure if it made a difference, but I certainly wasn’t going to mess with her recipe! This looks very good. Will try soon. Thanks for posting. I’m sure I’ll be missing out, but I can’t, I just can’t make this. Too many unhappy memories of British school dinners featuring tapioca pudding, England c. 1958. In fact so many of us loathed it, I doubt if I could buy tapioca anywhere. Your comment made me smile. I have similar memories of not liking tapioca when I was a child. It’s interesting how some foods that were popular in one era, are very unpopular in the next – and then may (or may not) become a food that people enjoy in an even later time period. You read my mind! I’ve been craving tapioca pudding lately all of a sudden. I haven’t had it in years, but my Mom used to make it all the time when I was little. The addition of maple syrup and walnuts sounds really neat! It’s a lovely dessert. If you like tapioca, I think that you’d enjoy this recipe. I’ve always had an aversion to tapioca (kind of like rhubarb and beets and lima beans), but the maple and walnut part sounds amazing, so maybe a rice pudding version? But then why do I like boba tea and not tapioca? Thinking aloud, I guess . . . . Happy 4th, Sheryl! I don’t know much about it – but I’ve read a little about food psychology and I find it absolutely fascinating. It’s interesting to think about why we like one food but not another – and how those preferences may change over time. Have a happy 4th, Luanne! This sounds rich and tasty. I haven’t had tapioca in decades. I really liked it in my youth. I had a relative that made it. I didn’t realize that it was sold in boxes like this. I’m going to put it on my grocery list and see if our local store carries it. I discovered Minute Tapioca during my college days after I moved into my first apartment. I loved it–never had it prior to then as it was never served in our house. I have not made it in years, though I occasionaly buy one pre-made at the store. The little pearls were part of the reason I liked it–love texture in my food! And, I love the beautiful bowl you have it in! The bowl is part of a set of vintage dessert dishes that I have. I also think it is lovely – though it probably isn’t a hundred years old. I’m guessing that it’s from the 1950s. Hehe I definitely love tapioca pudding and have been referred to as “great grandma” by my friends for enjoying it. Now I see why 😉 😉 Love this recipe though! Great grandma’s knew how to cook! I agree – in general foods seemed healthier back then. I’m glad you liked this post. Yum! My husband will LOVE this. Thanks for sharing! I love your site! Look forward to following along. Welcome! I have a lot of fun doing this blog, and it’s wonderful to hear that you enjoy it. Love this post. It brought me right back into my mother’s yellow kitchen with freshly starched white and yellow curtains. My mother’s success with tapioca pudding was like clockwork. She never missed and it was always rightly done.. I always missed here and there, and it is never perfect. Mr. and I taught all of our children how to make Tapioca Pudding and we taught them by having Tapioca Pudding making contests. They had lots of ideas to help us win. I never won, my husband follows the recipe and I miss here and there. Still there was never any pudding from both batches left for the next day! It’s wonderful to hear that you enjoyed this post. The tapioca pudding making contests sound like a great family activity. What fun! You shouldn’t let that Tapioca go to waste. 🙂 I think that you’d enjoy this recipe. I was surprised how quickly this pudding vanished at my house. Yeah! It’s wonderful to hear that you thought this post was worthy of including in this week’s Fab Finds. What a lovely special tasty looking dessert! I don’t eat tapioca a lot. So, I must try this lovely looking dessert with it! 🙂 Yum! The walnuts and maple syrup add a nice dimension to this recipe. I think so too! Yumm! This looks like such a delicious recipe!! Thanks a lot for sharing 🙂 Saving it.